I suppose I should clarify that this year I brought in one more criteria for how to assemble this list -- if it was a truly unique cinematic experience as well as a great film, then it goes into contention. That's how Manchester by the Sea, which has serious Oscar contention and is on plenty of other top 10 lists for 2016 and really was unique and excellent in its own right, gets knocked off of my list in favor of something that flew under far too many people's radar, like Embrace the Serpent. 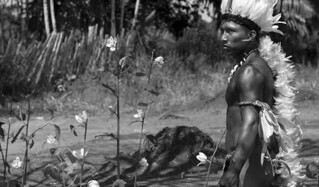 Some of it flew over my head, I will freely admit, but it was also a singular experience to such a degree that I can't help but recommend this Colombian film that examines colonialism through two white scientists visiting the same Amazonian shaman forty years apart. What I said then: Some parts of it, particularly the few seconds of actual color cinematography, and the only time it leaves the Amazon, seem a little like Colombia's answer to 2001: A Space Odyssey. Except this movie, instead of looking to the future, remains firmly entrenched in the past. In so doing, of course, it forces us to look at our present. 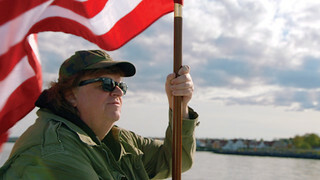 Michael Moore, as polarizing a figure as he is -- not even I always agree with his misguided guerilla antics -- does have a knack for landing his documentaries on my year-end top 10 lists. And this one, easily his most surprisingly hopeful movie to date, could be his best. The title is cheekily misleading, as the concept entails him visiting other countries the world over to find out what they do differently and better than the United States, and suggesting we "steal" the ideas -- from the fresh and high quality foods offered at public school lunches in France to the radically rehabilitative prisons of Norway (admittedly, he over-focuses a bit on Europe). The "twist" is that all of these seemingly radical ideas he finds elsewhere actually originated in the U.S. This movie is far less heavy-handed and much lighter in tone than Moore's previous films, which makes it much more accessible. The trick, I suppose, would be convincing the many people previously alienated by the man to give this movie a chance. What I said then: I have never been more moved by a documentary film. Or: Every American should see this movie. This one could qualify as my biggest movie surprise of 2016: I saw that it had good reviews, but it wasn't the type of movie that would ever be at the top of my priority list. I went to see it due to there being nothing better to go see that week. Turned out this was genuinely the best movie playing in theatres at the time: as the movie progressed, I found myself marveling at the degree to which it was exceeding my expectations. Rarely does a movie succeed so well at examining the moral gray areas of war, and this one narrows it down to a single choice: launch a drone strike that kills a known terrorist seen to be preparing for an attack, and save potentially hundreds of lives, or hold off on the attack in order to save a nearby little girl who would clearly be a collateral damage fatality? 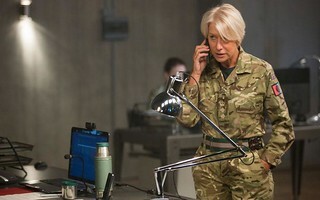 The fantastic cast, including Helen Mirren, Aaron Paul, Captain Phillips's Barkhad Abdi and even Alan Rickman in his final feature film role, demonstrate that this is not as black and white a question as it may seem, and it makes for truly provocative, edge-of-your-seat drama. What I said then: With deceptive simplicity, this movie presents the complexities of modern warfare in a way you won't see in other films. Who knew Tom Ford the fashion designer would be such a reliably great filmmaker? (His A Single Man was my #5 movie of 2009.) It's less surprising that such a person would prove truly adept at visually dazzling his audience, but Nocturnal animals has some truly satisfying, layered storytelling: an art gallery owner (Amy Adams) is basically terrorized by her ex (Jake Gyllenhaal) via a novel he's written and sent to her, the story therein clearly an allegory for how he feels about the horrible way she once betrayed him. Ford switches us back and forth between the present-day Amy Adams who is working her way through reading the book, as well as the memories of her relationship it's bringing back, and submerging us into the story-within-a-story that is the book itself (the characters from which are played fantastically by Michael Shannon, Aaron Taylor-Johnson, and also Jake Gyllenhaal). This is the kind of plot structure that easily could be messed up in the wrong hands: who wants to watch a person read a book, anyway? You do! Because this movie demands to be seen. What I said then: Tom Ford being a fashion designer turned film director makes for some interesting product, and Nocturnal Animals is a singular vision that could only come from such a man. You'll never convince me that writer Charlie Kaufman -- who wrote and directed this one -- is not a genius. 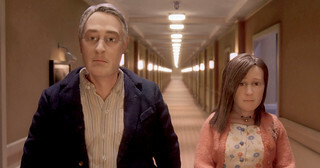 Anomalisa was somewhat polarizing; I know at least a couple of people with a seething hatred for it, which frankly escapes me. Granted, its literal assemblage is something many may have a hard time getting past: this is an R-rated drama presented with stop-motion animated puppets, and this is also a deceptively simple story, detailing the highs of immediate hopes and dreams followed by crushing realizations of reality shared between two incredibly lonely people who have a one-night stand at a hotel. But you'll also not see another movie, not even with live actors, that is more deeply in tune with what it means to be human. What I said then: Its human insights are truly deep. It sneaks up on you. It's rare that a movie so odd on the surface could speak so directly to the human experience. It makes you think about how many people experience their lives the very same way both Michael and Lisa do, with yearning desires for connections that are perpetually unsustained. Here we have the year's best mainstream blockbuster, which, by mainstream blockbuster standards, is more like an indie film -- especially considering its $3.7 million domestic gross, which falls so far short of its $18 million budget that I suppose that qualifies it as a box office flop. You'd never have known that to hear all the talk about it at the time it was released, or maybe it's just that the people I follow on Twitter have more of the same taste as I do. In any case, this was written and directed by Jeff Nichols, the man responsible for other great films like Take Shelter (my #7 movie of 2011) and the only slightly less-great Mud. He also wrote and directed this year's not-great but still very good Loving, but if you want some fantastically otherworldly entertainment that is also clearly a love letter to early-career Spielberg and specifically Close Encounters of the Third Kind, then stick with Midnight Special and its boy who has mysterious metaphysical powers via light coming out of his eyeballs. I know it sounds corny! Watch it anyway; you won't regret it. What I said then: If taken literally, Midnight Special is straight up preposterous. If taken as a metaphor for allowing your children to become their true selves, it works incredibly well. This is how Nichols works, in layered themes that go just deep enough. A solid Western for the modern era: this movie may have more cars than horses, but that doesn't make it any less of a Western. 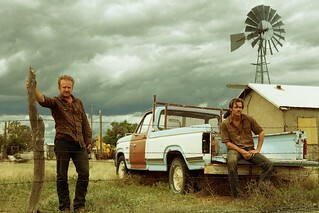 Ben Foster and Chris Pine are brothers committing a series of bank robberies in an attempt to steal back the money the same bank chain denied them, in order to save their late mother's farm -- and Jeff Bridges and Gil Birmingham are the local West Texas cops in pursuit. This movie takes a rare, honest look at rural Southern poverty, and with subtle precision illuminates the link between current economic circumstances and the nation's racist history. (This is most pointedly demonstrated through Birmingham's character, who is half Native American and half Mexican, both sides of which Bridges's character loves to needle him about.) Cinematically, there are shades of No Country for Old Men here, just in terms of slow build and tension; it is also written by Taylor Sheridan, who also wrote Sicario, my #2 movie of last year, giving it a very similar tone (it even has a similarly beautiful look, although the cinematographer is different). What I said then: It works well on a surface level, for viewers not concerned with deeper meaning, but has vast depths for those willing to see it. This isn't just a story about a couple of desperate bank robbers and the cops pursuing them. The weirdest great movie to come along in ages, or the greatest weird movie ever made? Maybe both! Consider the premise: in the world of The Lobster, it is illegal to be single for longer than 45 days. You either find true love in that time or you must be turned into an animal of your choice. Colin Farrell's David chooses a lobster, hence the movie's title. Said single people have to stay at a particular sort of resort, where David makes a lisping friend played by John C. Reilly, and Rachel Weisz is his potential love interest. This is very much my kind of movie in that it's a comedy that goes to some truly dark, sometimes gruesome places; The Lobster will easily fly over a lot of mainstream audiences' heads. But to my way of thinking, this is a movie that, while not quite perfect, touches on cinematic genius. 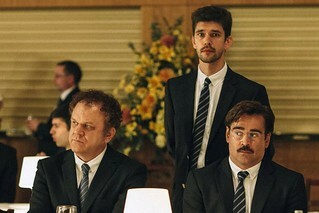 What I said then: The Lobster remains a delightful surprise in a multitude of ways. You'll still be thinking about it long after the credits roll, and the more you think about it, the greater the depth of appreciation becomes. Only one of two perfect films I saw in 2016, and Jackie has the added honor of being about something truly heartbreaking -- Jacqueline Kennedy's grief in the days immediately after the assassination of her husband -- and yet something I could watch over and over. The meticulous production design; the stellar, Oscar-worthy performance in the title role by Natalie Portman; the haunting score by Mica Levi; the unobtrusive yet noticeably excellent cinematography -- it all makes for a genuine work of cinematic beauty that warrants reexamination. I have zero complaints about this movie, unless you want to count the way it underscores the level of class -- and in particular Jackie's appreciation for history -- the Kennedys brought to the White House, which we all know will vanish with the Trumps in there. What I said then: Natalie Portman's performance as the First Lady in Jackie is nothing short of astonishing. A year after the "Oscars So White" backlash, the best movie of the year is about gay (or maybe just not-straight) black men, and although it still has far more male than female characters, it does have one of the year's strongest supporting characters in Naomie Harris's Paula, the one person present in the film's three distinctively separate parts. She plays addict mother to Chiron, who is played at three different ages by three different actors, the best of whom are Ashton Sanders as the teenager and Trevante Rhodes as the twenty-something. These two are matched by the friend who facilitates the awakening of Chiron's sexuality, Kevin, played by Jharrel Jerome as the teen and André Holland as the adult. (The child actors in the first third, Jaden Piner and especially Alex Hibbert as "Little" Chiron, are very good too; they just don't have quite the same impact.) This is the makings of an ensemble film with a lot of people playing only two characters, and a particularly memorable performance by Mahershala Ali as a father figure who is only present in the first third. You can imagine the logistical challenges of all this, yet writer-director Barry Jenkins pulls it all together with impressive precision. Beautifully shot and exquisitely edited, Moonlight also features deeply affecting performances. What I said then: Moonlight is a movie that takes its time revealing exactly what's going on, but once it becomes clear, the need for taking this journey there is well understood. I can't think of anything to criticize this movie for, which is a rare thing indeed. As always, it should be noted that indeed a whole lot of worse movies were released this year than these five. In fact, this year in particular the "worst" movies I saw are better than usual. But I don't get paid to review movies, so why should I go to movies I already know are even worse than what's on this list? This just represents some of the few films I misjudged and thought I might actually enjoy -- and was wrong. I saw so few sub-par movies this year that I can't even round up five whole movies I graded below a B-. I didn’t even regret seeing American Honey, but of all the B- movies I had to choose from to put in this spot, I chose this one because it is the least likely for me to recommend to anyone else -- its stellar reviews notwithstanding. Although well shot and well acted, the story of love between young traveling salespeople never justifies its truly excessive length of 2 hours and 43 minutes. What I said then: Being unpredictable does not on its own give a given story a particular vitality. And frankly, there's nothing vital whatsoever about American Honey. I saw it, it was too long but it was still fine, and you really don't need to see it. Woody Allen makes movies every year. Inevitably, some of them are kind of duds. This one is less of a dud than it's just . . . dull. What I said then: Here's one for those of you who think I give movies good reviews too often: not only did I find Woody Allen's latest film to be a fundamental disappointment, I am also an outlier on that point, given its generally positive reviews. Honestly why anyone would think this movie is all that great is mystifying to me. This one, while enjoyed by many, might qualify as the one film in 2016 that failed to meet its potential by the widest margin. Everyone onscreen is having way more fun than anyone in the audience is, and that strikes me as kind of a problem. And the cast is full of people who are fun enough to spend time with, from Jennifer Aniston to T.J. Miller to Jillian Bell and especially Kate McKinnon (easily the best part of this movie, and yet even she's not as good as she is in other stuff). They're just all saddled with material that should not have been that hard to make far better, or at the least more consistently funny. A movie like this promises hilarity and all it delivers is sporadic chuckles. What I said then: Office Christmas Party tries really hard to be a blast, and therein lies its problem. You spend most of this movie feeling how hard it's trying, and not having the blast it's straining to promise you. I was so excited for this movie! It seemed tailor-made for me -- a crumbling dystopian society inside a skyscraper! Too bad it turned out to be an unmitigated and incomprehensible mess, some really great visuals notwithstanding. What I said then: Chaos reigns between the residents of this tower, but getting to that point has no natural trajectory in this story. Tensions are building slightly, and then seemingly out of nowhere, the descent into madness appears via thoroughly confusing montage. This was where High-Rise lost me. After that, through the rest of the movie, more than once I found myself thinking, What the hell? I didn't write a review to this movie. Conflict of interest: my husband had a part in it. How much fun it genuinely was to see him in his small part has no bearing on the fact that it was the worst movie I saw all year. I'm even censoring the title just so anyone involved in it can't find it here if they Google it. This is the latest in a long line of zombie movies, except this one wants to be one in quotes: "zombie movie," with an admittedly clever twist at the end that still is not clever enough to redeem the rest of the movie. And, to be fair, I should stress that this is far from the worst movie I have ever seen, and it had a few (though not many) redeeming qualities -- it's just that every other movie I saw in the theatre in 2016 was better. What I said then: Actually I made the calculated decision at the time not to have any critical comment. And now, below, the perennial film log . . .